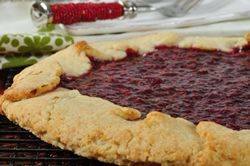 While looking through Giada De Laurentiis's cookbook, Everyday Italian, a recipe for a Raspberry Crostata stood out. What I loved about it, was its simplicity. Just a round of pastry topped with jam, that is baked in a hot oven until the pastry has become all wonderfully brown and crisp. So here is my version of a Raspberry Crostata. And did you know that 'Crostata' is just another name for 'tart', albeit one that is baked free form rather than in a tart pan? What this means is that we just roll the pastry into a round, spread on the filling, and then fold the edges of the pastry up and over the filling. To be honest I really enjoy this Raspberry Crostata as a breakfast or brunch dish for I like it's a great substitute for toast and jam. I have used my favorite pastry for this Raspberry Crostata. It's called Pate Brisee, pronounced 'paht bree-ZAY' which is a French short crust pastry made with butter. It has a high ratio of fat to flour which gives the pastry its crisp and crumbly texture and buttery flavor. For the raspberry jam I like to use homemade, although you can use any high quality commercially made jam. And don't feel you have to use raspberry jam as other flavored jams can be used in this tart. Raspberry Jam: Make the jam at least one day (or up to 10 days) before making the Crostata. In a small bowl stir the pectin into the sugar. Place the frozen unsweetened raspberries and the sugar mixture in a medium sized saucepan and, over medium heat, bring to a boil, stirring frequently. When it's at a full boil, adjust the heat to keep the mixture at a full boil and, stirring frequently, cook for about six minutes. Do not let it burn. (As the jam boils, you will notice large bubbles and some foam. You can skim off the foam if you like. As the jam continues to boil the foam will subside, the bubbles will get smaller, and the jam will become darker in color, with a glossy sheen.) Remove from heat and, if you like, do the Freezer Test to check its consistency. To do this, place a little jam on a frozen spoon, wait a minute for the jam to cool down, and check the consistency. If the jam isn't firm enough, return the saucepan to the heat and cook a little longer. Once made, stir in the lemon juice and strain if you want to remove the seeds. Transfer to a heatproof jar or bowl and let cool. Then cover and store in the refrigerator. You will need 3/4 cup (225 grams) of raspberry jam for this crostata. This recipe makes about 1 1/2 cups (450 grams) of raspberry jam. Preheat your oven to 400 degrees F (200 degrees C). Line a baking sheet with parchment paper (or butter your baking sheet). Once the pastry has chilled, remove from refrigerator and place on a lightly floured surface. Roll the pastry into an 11 inch (28 cm) round. To prevent the pastry from sticking to the counter and to ensure uniform thickness, keep lifting up and turning the pastry a quarter turn as you roll (always roll from the center of the pastry outwards to get uniform thickness). Transfer the pastry to your baking sheet. Spread about 3/4 cup (225 grams) of raspberry jam onto the pastry, leaving a 2 inch (5 cm) border. Gently fold the edges of the pastry up and over the filling, pleating as necessary. Make sure to seal any cracks in the pastry. If desired, brush the edges of the pastry with a little cream and sprinkle with some granulated white sugar. Bake for about 35 minutes or until the pastry is golden brown and cooked through. Remove from oven and place on a wire rack to cool. You can dust the top of the crostata with powdered sugar before serving. Serve plain or with softly whipped cream or vanilla ice cream.